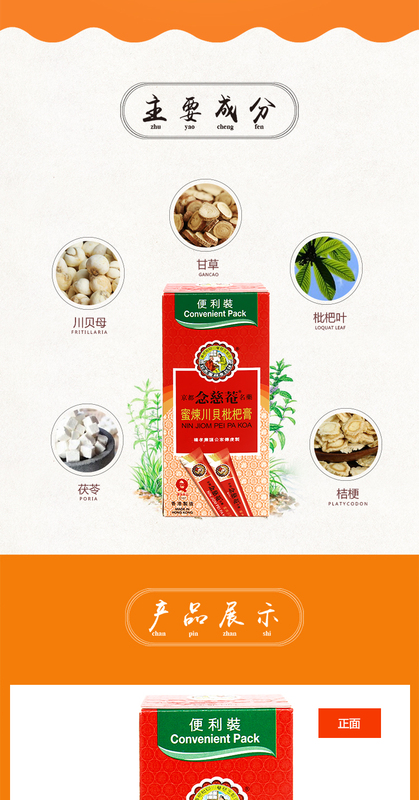 Natrual herbs, loquat & honey extract - known popularly in the Chinese as "PEI PA KOA" was originated by Nin Jiom of Beijing in the Qing Dynasty. 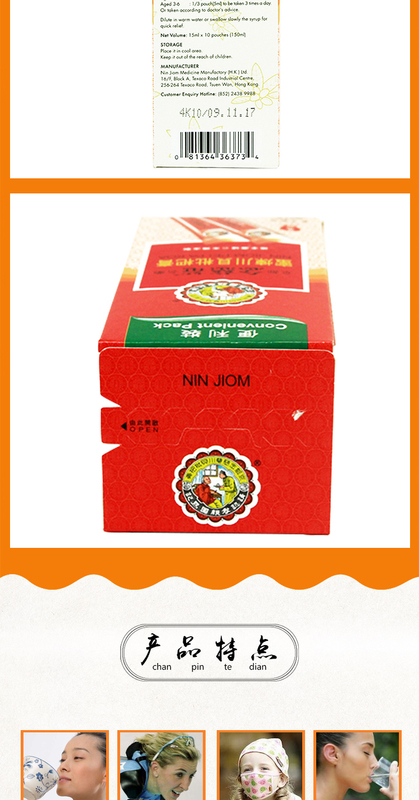 It has been very popular for centuries because of its effectiveness and pleasant taste. Aged over 12: one pouch (15ml) to be taken 3 times a day. Aged 7-12: 2/3 pouch (10ml) to be taken 3 times a day; Aged 3-6: 1/3 pouch (5ml) to be taken 3 times a day. Or taken according to doctor's advice. Pregnant woman is advised to consult doctor before taking. Children under 3 are advised to consult doctor before taking. If you have a fever over 38°C or coughing persists for more than a week, please consult doctor immediately. Preserve in tightly closed container. Place it in cool area. Keep it out of the reach of children. 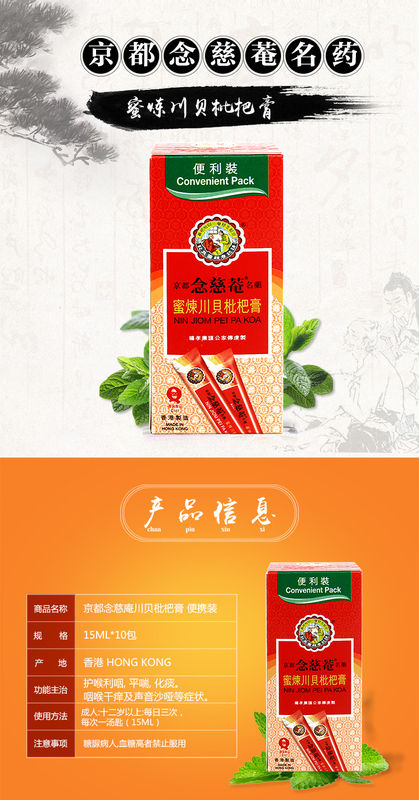 Nourish the lung, elimiate phlegm and relieve cough. To soothe the sore throat, and remove heat. 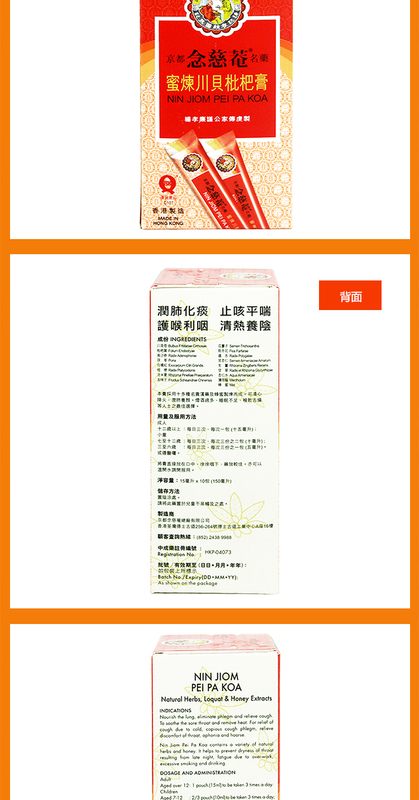 For relief of cough due to cold, copious cough phlegm, relieve discomfort of throat, aphonia and hoarse.